White water rafting on the Arkansas River doesn’t get much better than this! For the complete river experience, escape with us on one of our exciting, scenic, and revitalizing two- or three-day Arkansas River trips! As you encounter class II-IV rapids, paddle through quintessential gorgeous Rocky Mountain scenery, and ‘unplug’ under the stars at our riverside campsites, our multi-day trips are sure to be an unforgettable adventure for you and your family or friends. We run a variety of Arkansas River rafting trips that access different sections of the river, and based on the needs, expectations, and skill levels of the participants, we will design the perfect trip for your group. You won’t even need to worry about the details: we’ll take care of equipment, transportation to and from our rafting office, and meal preparation. 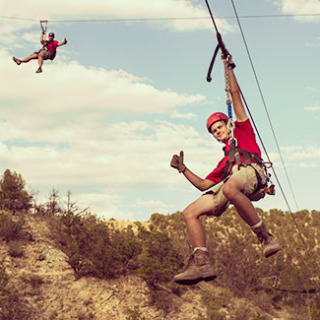 From family-class to adventure-class whitewater, the Arkansas River has something for everyone. After checking into our Echo Canyon office in Cañon City, we’ll transport you to the start of your multi-day rafting trip in beautiful Chaffee County. While rafting in the Buena Vista area on sections such as The Numbers and Browns Canyon, you’ll be near the base of the majestic Collegiate Peaks, a section of the Sawatch Range of the Rocky Mountains that includes over a half-dozen “fourteeners” (peaks over 14,000 feet tall). In this area, you’ll paddle and camp amongst granite boulders and soaring pine trees. The majority of our Arkansas River rafting trips take you through Browns Canyon, recently-designated a National Monument in 2015. Over a hundred miles of the Arkansas River is recognized as a Gold Medal Steam for fishing, so bring your pole and fishing license along with you and try your luck at landing a rainbow trout while at camp. Further downstream, near Cañon City, you’ll see rugged red-rock canyons, the cactus-strewn high desert environment of Bighorn Sheep Canyon, and even the world-famous Royal Gorge. Not only do our multi-day Arkansas River rafting trips offer some of the most beautiful scenery and exciting rapids in all of Colorado, they also provide some of the most relaxing overnight stays. Each night, you’ll relax by the riverside and enjoy games, a campfire, and hearty, delicious meals prepared by your guides. They pride themselves on preparing extraordinary hot meals that will leave you wondering how they prepared it all in a campsite! After dinner, you can fall asleep to the sound of laughter by the campfire and the soothing ripple of the Arkansas River against the shore. Traveling? New to camping? Don’t worry about bringing or buying specialized equipment! We’ll take care of sleeping bags, sleeping pads, camp pillows, double-occupancy tents, camp chairs, and other camping gear on all multi-day Arkansas River Rafting trips. All you’ll need to bring are personal items, toiletries, and clothing. (An overnight camping list is available here.) Additionally, a full wetsuit package is included with all of our multi-day Arkansas River trips. Our white water rafting Arkansas River trips are tailored to match your group’s needs and expectations. Call us at 800-755-3246 and ask to speak to a multi-day coordinator and we’ll assist you in crafting a personalized overnight excursion. Rafting the Arkansas River in Colorado is a great way to see the best of what summertime in the Rocky Mountains has to offer!